...is an all inclusive ski trip to Club Med in Yabuli. M'Lynn's been itching to go skiing since we moved to Harbin. "We're so close." she always says. And we are. 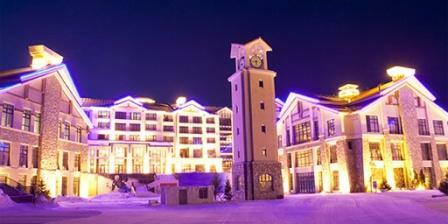 We're only a short train ride from the best ski resort in China, Yabuli Sun Mountain. When she watched Anthony Bourdain's "No Reservations" show last year she wanted to go skiing all the more. We'll see if we actually make it over to the mountain to ski. There's no doubt we won't be staying at the resort, we'll just use the mountain and ski rentals. French leisure group Club Med formally opens its first resort in China on Tuesday in the icy northeast, cashing in on a newfound love for winter sports among an increasingly wealthy middle class. Club Med is hoping to attract clients from across China, and even Southeast Asia, to its new village in Yabuli, which features 18 ski slopes -- and winter temperatures often below minus 30 degrees Celsius (minus 22 Fahrenheit). "Most of the industry is in decline. China is really the only place where the industry is growing," Justin Downes, a Canadian from the ski resort of Whistler who advises investors on the winter sports sector in China, told AFP. Club Med will also offer plenty of indoor winter pursuits such as karaoke and mah-jong for those not willing to brave the frigid Siberian winds. Chinese clients "are not keen on skiing eight hours a day. They want to have other things to do," Downes said.